Free with Museum admission. MoCC is always free to the PNCA community. Common Threads is an inter-generational collaboration between members of the Columbia Fiber Arts Guild (CFG) and undergraduate students of Pacific Northwest College of Art (PNCA). Throughout the summer, CFG members mentored PNCA students, working with them in groups and one-on-one to develop skills in the field of fiber including: wet felting, knitting, quilting, natural and acid dying, embroidery, weaving, and spinning. Facilitated by Museum of Contemporary Craft (MoCC), the purpose of this collaboration is to perpetuate knowledge of craft-based techniques and to explore ways that traditional fiber skills are integrated into fine art studio practice. Common Threads celebrates the diversity of the creative landscape, highlighting the importance of handcraft in the work of established and emerging artists. This exhibition features many of the materials, processes, and artworks that emerged from this unique collaboration. At its core, this ongoing mentorship demonstrates how relationships can develop when makers of different generations are given the opportunity to learn and create together. 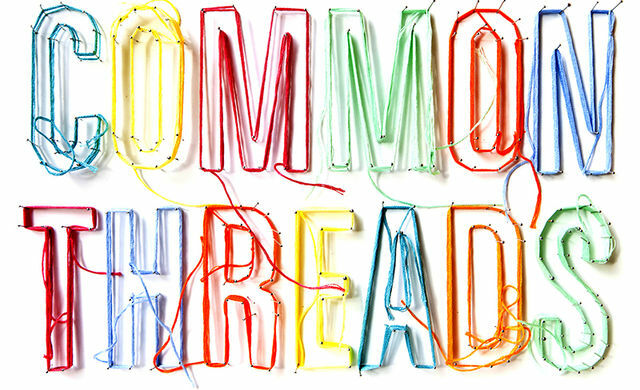 Beyond artwork, Common Threads reveals the unique moments the act of crafting can construct. This project is not simply about showing the hand knitted sweater designed by a student and made under the skilled leadership of a mentor; it is about the quiet afternoons the student and mentor spent knitting a friendship through their shared desire to see craft continue to live and grow. Witnessing the growth of this program and the relationships formed between the mentors and students has given MoCC the opportunity to reify the strength of fiber arts as a binding force in our individual and collective lives. The Community Showcase and Lab exhibits outstanding community artwork and featured partnership projects. Common Threads was organized by Sarah Margolis-Pineo, Associate Curator, MoCC, and Chelsea Heffner, Foundation & Thesis Department, PNCA, with assistance from Caitlin Sweet, MFA Candidate, Applied Craft + Design, a joint program of PNCA and Oregon College of Art & Craft. As Oregon’s flagship college of art and design since 1909, Pacific Northwest College of Art has helped shape Oregon’s visual arts landscape for more than a century. PNCA is now embarking on its boldest venture yet by establishing the Arlene and Harold Schnitzer Center for Art and Design as an anchor for the College’s vision of a new campus home on Portland’s North Park Blocks. Columbia Fiber Arts Guild was established in 1969 to provide a network and forum for fiber artists of all abilities and encompassing all aspects of fiber art.